Soft contact lenses are in fact soft. They are very supple; they can even be folded or turned inside out. When a contact lens is on your eye it can be more than half tear film. But, it is the size of the lens that makes it so very comfortable. The lens fits well underneath your lids, limiting the interaction between the lens and the edge of your lid providing astonishing comfort, even if you have never worn a lens before. New wearers need to build their tolerance to contact lenses by slowly increasing their daily wear times over their first week of wear. While, your Parrelli Optical® contact lens specialist can see adaptive symptoms on the front of your eye through your first weeks, most patients have no real symptoms after the first few hours with lenses on. Many years ago we gave patients a single pair of lenses and a rather complex care kit and said “Try to make these last six to twelve months.” Soft lenses are about 50% tear film when they are on your eye. As the tear passed through the lens it deposited organic substances like calcium, lipid and mucus on the contact. Environmental contaminants also collected on the lens surface. As a result by the end of the 1980’s we were sending patients home with a burdensome chemistry kit to care for their lenses. As you might imagine, compliance was an issue and we began to see a wide variety of complications directly attributable to dirty lenses. 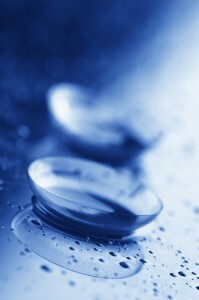 In 1988 manufacturing engineers studied the problem and created new ways to fabricate contact lenses. The results are better quality products in a wider array of designs that can be affordably replaced on some kind of a pre-planned schedule. One Day: These lenses are opened from a sterile package, worn and thrown away after one use. There is no care regime required. One day lenses are the healthiest and safest way to wear contacts. They are exceptionally convenient and are recommended for young eyes. Two week: This lens is designed to be used 14 times or be open for 30 days. If you are wearing lenses every day, you would replace them after two weeks. Care of these lenses requires a multi-purpose solution. After removal, the lenses are rubbed, rinsed and stored, all with one product. Until recently this was the most popular modality. Monthly: Increasingly popular monthly designs offer a greater variety of correction options (astigmatism and bifocal designs in particular). Because we do so little on a two week schedule, the increase in popularity of this lens can be traced to the simple fact that it is easier to remember to replace your contacts once a month than to remember to do it every two weeks. The longer replacement schedule requires a more aggressive care system. Each day after removal, the lens is rinsed and then stored for six hours in a more effective cleaning and disinfecting agent. This is the modern paradigm, most manufacturer’s newest designs are in the monthly format. Quarterly: Highly specialized designs for unique prescriptions may require custom designed lenses that are replaced every two to three months. These require a significant increase in daily maintenance to be safely cleaned and disinfected.